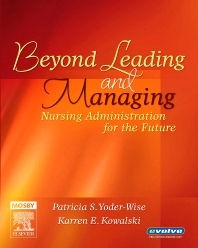 Beyond Leading and Managing focuses on real life stories and anecdotes about the practice of nursing administration. It highlights key information such as advanced administrative theory, financial decisions, quality control, working with external groups and individuals, planning strategically, and creating new opportunities within the profession. Theory boxes, case studies, and current literature and research located both in the book and on the Evolve website help the reader grasp the key points, remember them and think about the practicality of the content in the real world of leading in healthcare organizations. A brief overview of the chapter helps focus readers and the content builds the base of important information about the topic. Literature boxes pull out and summarize key relevant theories in nursing administration. Contemplations (questions to ponder about the topic) are included to help readers think about the practicality of the content. Leadership Stories offer actual scenarios of practice from a professional view. Administration certification is included as key content in the text. Evolve website offers web links and current research/literature recommended by the authors.